And would you consider doing it in this dress from Topshop? I would definitely wear this dress, it's so over-the-top festive (it reminds me of the Betabrands Lust Skirt). Probably with black tights and high-heeled lace-up boots (to give it a little edge). And silver eyeliner, maybe? Click on the image to check out the back, which sensibly has no sequins at all (so that you aren't poked every time you sit down). I'm ridiculously excited for this trip to Australia. Can't wait! 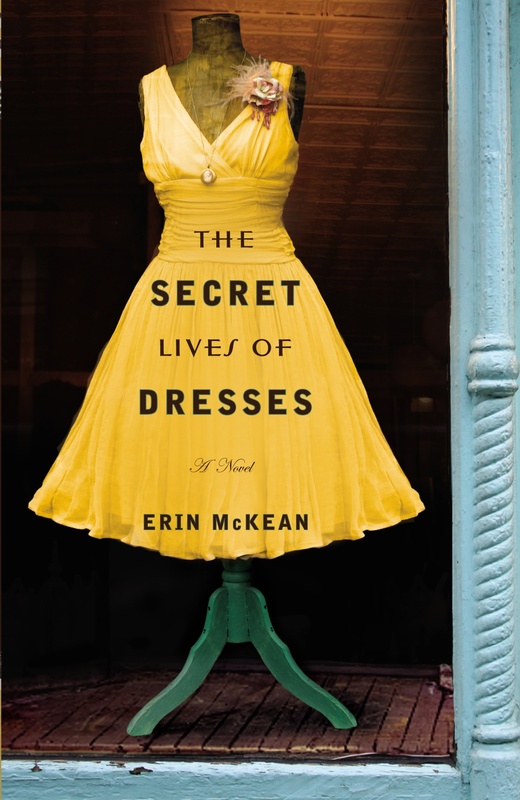 Green Dress: If I fix my gaze firmly on the ground over there, I can't possibly be held responsible for anything that's going on to my right. Blue Dress: Dammit, this propane torch won't light! And the man at the shop guaranteed instant ignition? 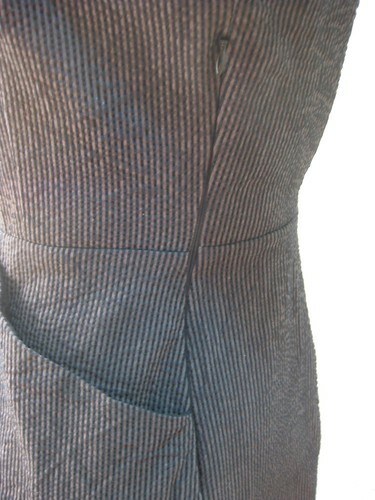 Plaid Dress: She thinks she's being so stealthy, but won't she be surprised to learn my dress is made of asbestos fiber? Gray dress: Don't let anybody tell you that a chair with disappearing legs is better to lean against than a disappearing ledge. It's just not true, despite what Miss Cherry Jumper over there seems to think. Miss Cherry Jumper: I wish I had worn my glasses after all. I can't read that sign … does it say "don't lean on the disappearing chair?" I hope not, those disappearing ledges are so dangerous. This pattern is on sale now through Sunday (as are all the patterns at http://risingfeenix.com/inc/sdetail/64659 — use the code GONECAMPING for 15% off). Unfortunately, this one isn't in my size, anyone have one in a bust 34? 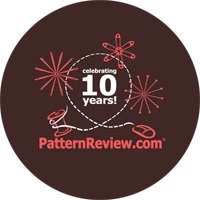 Pattern Review is celebrating its tenth anniversary! Congratulations to Deepika and to all the PR members who make PR such a great site — with more than ninety THOUSAND pattern reviews, PR is the first place I look when I'm deciding whether or not to make a commercial pattern. If you're not a member (basic membership is free! ), you really should be. There are a bunch of PR Day meetups going on all over the world this coming Saturday, November 19th (I wish I could go to PR Day Denmark!) … check out the list here. Although I'm afraid that perhaps what's really pulling me towards this pattern is the pocket topstitching, which I would almost certainly be too lazy to do. (And her truly exceptional liquid-eyeliner skills — at 40, is it too late for me to master that? I suppose it doesn't really go well with glasses …) And that armhole is a bit deep for me … even with a t-shirt under it, it can look weird. Is anyone else thinking jumpers? Or going beyond the "thinking" stage to the "making" stage? If so, what patterns are you using? Oh, Yeah, This Pattern Too. 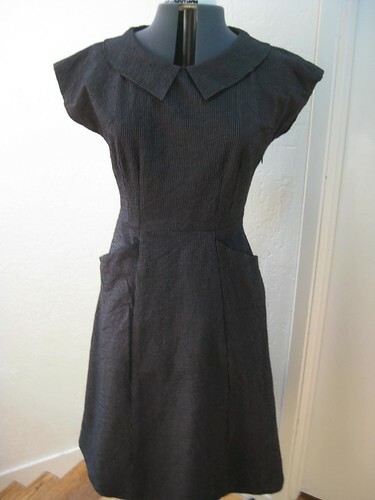 This dress is extremely comfortable to wear, and even though it's seersucker, preferred fabric of summer, I've been wearing it all November-style with a long-sleeved black tee and black knee socks (and Justin roper boots) which is a little goth Dickensian orphan, but in a good way. 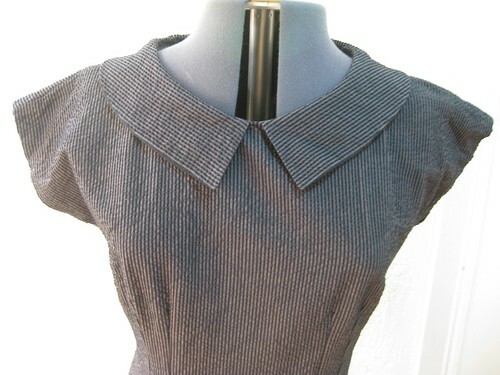 I really like this heavy version of this dress, so I bought some black cotton faille and am going to make it again. 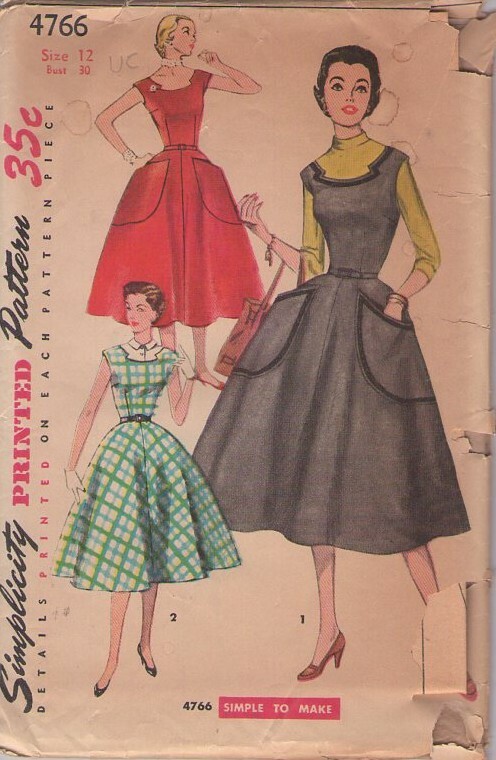 I also have a black and beige faille, and a heavy houndstooth in brown and black … and some maroon stripey wool, and a truly maddening unmatchable plaid, all of which might be good candidates for this pattern. But don't worry — I also made two more Liberty Vogue 8728s. You'll see them soon! Happy New Year! 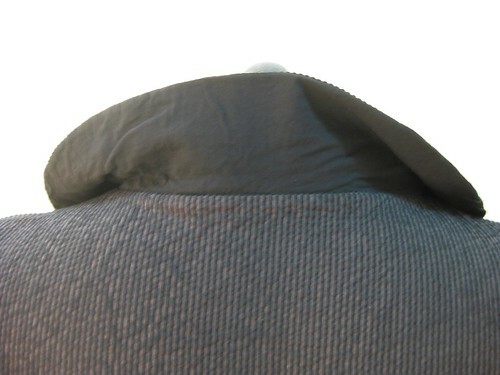 Here, Have a Hat!